When maintained properly, waterproof golf shoes should last you several years. If you own waterproof golf shoes or have waterproofed your shoes with a spray-on coating, it's important to take proper care of the footwear to extend its life. If you primarily play in dry conditions, the shoes won't pick up much moisture and will require minimal cleaning. If you play on wet courses, however, your shoes will need some attention following the completion of each round. 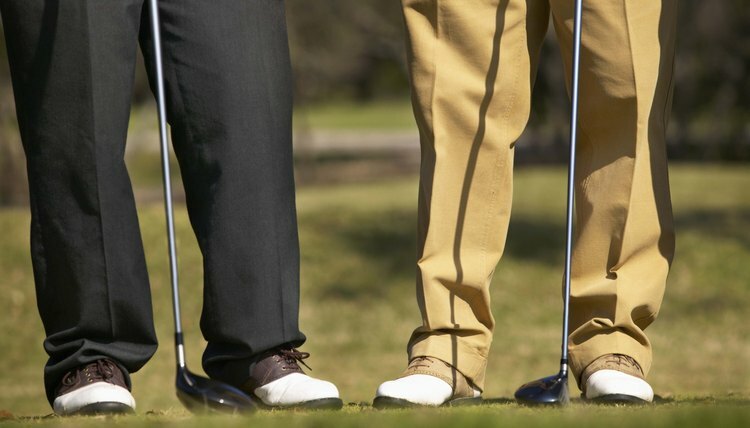 Wipe down the entire surface of the shoes with a towel upon completing your round of golf. Further care is required once you arrive home, but it's important to remove any water from the shoes as soon as possible. Remove dirt, grass and other debris from the outsoles of the waterproof shoes by rubbing them vigorously with a stiff-bristled brush. Pay special attention to the cleats, which often hold dirt.